Pumpkin, maple AND coffee cake? You probably all think I'm pushing it. Well, maybe I am. I'm sure by now we are all sick of pumpkin recipes floating around on pinterest and blog land. Maybe you don't even like pumpkin to begin with. Maybe pumpkin is your favorite and you'll eat it any chance you get through the fall season. Who knows. To me, pumpkin is okay. I like pumpkin pie. I love pumpkin seeds. If you are not a huge pie fan, I'm with you. The crust seems so dry to me and I'd rather have a brownie. So, for all of you pumpkin lovers or pie haters, here is a little fall recipe to try this season. I also encourage you to bake with your friends and family. I made these cupcakes with my brother's girlfriend and we had a great time baking together. 'Tis the season, right? Mix all of your cupcake ingredients until combined. Then, scoop 1-2 Tablespoons of the batter into each cupcake liner. Mix your crumble mixture and sprinkle it into each cup, using only 1/2 of the mixture. Then, cover with remaining batter and top with another layer of crumble. Let your cupcakes cool while you make the glaze. I just combine about 2 cups of powdered sugar with a splash of milk and vanilla and mix it until it is a glaze consistency. Keep adding milk a tiny bit at a time and mixing until it looks right. Stick your glaze in a resealable bag and clip the corner to use as a piping bag ( If you don't have a piping bag, that is). Finally, add your glaze and enjoy! We should have waited a bit longer to glaze these because they were not cool enough, but we couldn't wait to try them! 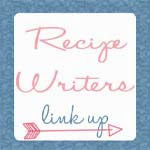 Don't forget to link up your favorite Thanksgiving Recipes with Recipe Writers this month! These look delicious! I wouldn't say that I'm a huge fan of pumpkin, per se. It's okay. 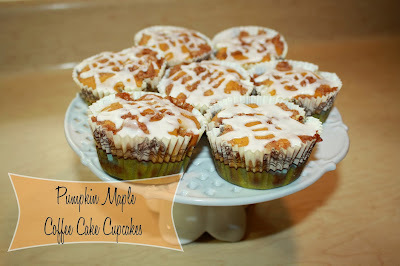 But when October and November roll around, I definitely feel an urge to eat pumpkin-flavored everything!